The images of a grocery bag with legs running down a railroad track or of a cartoon car racing to beat a train across the tracks are not ones that employees of Mn/DOT’s Rail unit take lightly. However, these are the images currently portrayed in a local grocery store commercial and a summer children’s movie. Six Minnesota pedestrians were struck by trains during a two-week period in May. As a result, four people lost their lives and two suffered serious injuries. This brings the reported number of pedestrians injured and killed on railroad property in 2006 to nine. Another disturbing image is presented in the Disney/Pixar movie “Cars.” The movie’s rookie race car, Lightning McQueen, ignores the warning lights at a highway-rail crossing and darts across the railroad tracks in front of an approaching train to win a race. “Unfortunately, when you race a train, you’ll lose, even when there is a tie,” Gardner said. Minnesota is not the only state that has seen dramatic increases in pedestrian and trespass incidents along rail lines in 2006. The Federal Railroad Administration reports a 29 percent increase in trespass casualties in Region 4 (Illinois, Indiana, Michigan, Minnesota and Wisconsin), when the agency compares the period of October 2004 through March 2005 with the same time period in 2005-06. If you come to a railroad crossing and see flashing red lights, don’t ignore them. Stop! These lights signal the approach of a train. Never drive or walk past flashing lights or around lowered gates at a crossing. Wait until the lights have stopped flashing and the gates go completely up. You cannot always feel the vibration of an oncoming train. Don’t expect vibrating rails or track beds to warn you of an approaching train in time to save your life. Trains overhang the rails on each side by at least three feet. Loose straps hanging from freight cars may extend much further. If you need to cross the tracks, whether in a vehicle or by foot, the only safe place to do so is at a designated public crossing with a crossbuck, flashing red lights, marked pavement and crossing, or a crossing gate. If you cross at any other place, you not only risk injury or your life, but you are trespassing and can be ticketed or fined. Remember, if the gates stay down, there may be a second train coming on that or another track. Wait until the signals tell you that all is clear. On June 30, Mn/DOT’s monitoring of the water discharge at Camp Coldwater Spring, northeast of the new Hwy 55/Hwy 62 interchange near Fort Snelling, will end. The monitoring was part of an agreement with the Minnehaha Creek Watershed District to resume construction of the interchange in 2003. “We agreed to monitor the flow for 30 months after construction of drainage modifications at the interchange were completed in 2003,” said Nancy Radle, Mn/DOT geologist. Construction at the interchange was halted in September 2001 because of the watershed district’s concerns that roadway changes would affect water flow to the spring. Steve Adamsky, project engineer, said that Hwy 62/Hwy 55 interchange design changes helped minimize groundwater concerns. “The roadway was raised as high as possible without impacting bridge clearance. We couldn’t reconstruct the bridge because of airport limits on bridge heights,” he said. Other interchange design changes were made in the agreement with the watershed district. For example, a geosynthetic liner was installed under Hwy 62 to allow groundwater to flow under the roadway unobstructed on its way to the spring, Adamsky said. Mn/DOT expected these design solutions to prevent significant changes to the groundwater flow to the spring, but this could not be proven until the interchange was completed and some time had gone by. 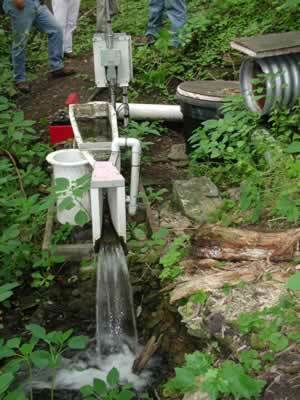 The watershed district agreed to let construction resume, but it wanted to see final, substantial proof that the groundwater flow to Camp Coldwater Spring was ultimately not affected. The site, which has historical significance as an 1820 camp for U.S. troops building Fort Snelling, is unassuming and difficult to find if you don’t know what to look for. However, it is still valued by many, including the Minnehaha Creek Watershed District, which will continue to monitor spring flow indefinitely. The National Park Service is also considering possible future uses for the site. Mn/DOT is not completely finished with work in the Hwy 62/Hwy 55 interchange area, Adamsky said, noting that the department will be doing landscaping in the area during the next two years. 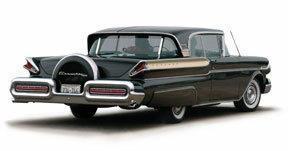 Backed by a display of vintage cars, trucks and other vehicles, Lt. Gov./ Commissioner Carol Molnau and Tom Sorel, FHWA area administrator, will lead Mn/DOT’s June 29 celebration of the interstate highway system’s 50th anniversary at the Transportation Building in St. Paul. The vehicle display begins at 10 a.m.; a news conference that will include remarks by Molnau and Sorel will start at 1:30 p.m. Ice cream and cake will be served following the news conference. The celebration will honor President Dwight D. Eisenhower’s signing of the legislation which created the interstate highway system on June 29, 1956. Since its authorization, the interstate system has revolutionized highway travel in the United States. The system has changed the nation’s landscape, made possible long-distance, high-speed travel and created new expectations about the levels of safety and service on the nation’s roadways. Mn/DOT has built more than 950 miles of interstate highways on its three principal routes: I-35, I-90 and I-94. The final section of interstate highway constructed in Minnesota—I-94 east of St. Paul—was opened in 1987. The first interstate section—I-35 between Owatonna and Medford—was completed in 1958. For more information about Minnesota’s role in the interstate system, go to: http://www.dot.state.mn.us/interstate50 /. Mn/DOT received no bids during the Friday, June 16 letting of the Interstate 35W/Hwy 62 Crosstown reconstruction project. The project is a 3.5-year construction project, with an estimated cost of $250 million. The contract had proposed a pre-determined schedule of monthly payments, rather the more typical “as submitted” basis, for the first 2.5 years of construction. This, said Bob McFarlin, assistant to Commissioner Molnau, would allow Mn/DOT to begin the Crosstown project this summer and complete it by the end of 2009. "We are disappointed that the I-35W/Crosstown project proposal did not receive contractor bids. We had proposed an aggressive and innovative contract based on a predetermined schedule of payments by the state. The approach was created to address the scheduled federal transportation funding the state expects to receive in the immediate future," said McFarlin. McFarlin said all parties—Mn/DOT, contractors and partners—learned a great deal during this process. One of singer Aretha Franklin’s most popular songs spells out a basic human need: R-E-S-P-E-C-T.
Franklin’s version of Otis Redding’s “Respect” is about a man and a woman, but the need for respect affects other aspects of life as well, including the workplace. 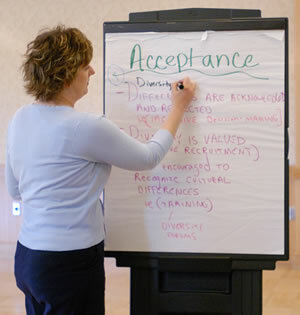 Mn/DOT’s new Respectful Workplace initiative seeks ways to ensure respect for people regardless of factors such as age, gender, cultural identity, religious faith or political views. If perceived doubts about an employee’s worth, ability or integrity continue, he or she may never have a chance to develop their own potential or fully support the work unit’s goals, she said. “A workplace that doesn’t value the people in it may fail because energy needed for its mission may be drained away by unresolved personal issues,” said Lynnette Geschwind, Affirmative Action Office director. The initiative stems from the AAO and other department efforts to reduce workplace violence and a proposal developed during Mn/DOT’s recent Leadership Institute class. “Unresolved conflicts or resentments stemming from disrespect can simmer for a long time, then erupt into open conflict or even violence,” Farraher said. All of the Metro District’s maintenance employees and managers recently completed a three-hour training session on creating a respectful work place. “Our main work to accomplish a respectful workplace focuses on how we treat each other and perceive each other’s actions day in and day out—in good times and in bad,” she said. 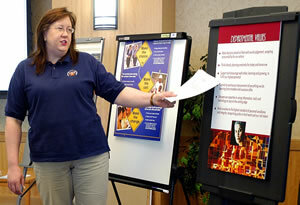 The Bemidji and Duluth districts held sessions for their maintenance supervisors and managers in April. Work groups of any size create “norms,” informal but very real work practices and values that determine who, for example, is allowed to raise questions or recommend action, how the unit assigns tasks, where members go for coffee or lunch, even who sits where at the break table. Norms that may cause conflict can be strongest in small work groups such as those in truck stations, but Johnson notes many small workplaces have positive norms that can serve as examples as the effort continues. Cultural changes in society are reflected the workplace. There are more women and people of color working, for example, and practices such as “taking it outside” to resolve disputes are no longer accepted ways to defuse workplace conflicts. Geschwind said the program doesn’t ask employees to check their own values and beliefs at the door, but to respect those of their fellow employees. “People do their best work when knowing they and the work they do are valued,” she said. “An effort like this will help supervisors and managers better understand group dynamics and the needs and wants of Mn/DOT employees,” said Greg Pierzina, area maintenance supervisor at Virginia . “The training helps us acknowledge those differences in a respectful way instead of ignoring them and to resolve small problems between employees before they can become big ones,” he said. Geschwind said the initiative is part of Mn/DOT’s over-arching effort to minimize workplace stress and create more effective work units. “When people respect and understand each other, it helps us all to avoid unnecessary conflict and to enable individuals and work groups reach their fullest potential and effectiveness,” she said. State employees are encouraged to help their fellow employees by donating to the state’s vacation donation program, a program designed to help critically ill state employees who have used up all sick and vacation time due to their illness. Terry Condon, a transportation specialist in the District 6/Owatonna Construction Office. Condon has worked for Mn/DOT for more than 10 years, and underwent neurosurgery. He expects to be off work for at least three months as he recovers from major surgery. Bridget Miller, District 4/Detroit Lakes engineer, whose daughter, Ellie, was born May 15, 2006, with a severe birth defect called congenital diaphragmatic hernia. On May 19, Ellie survived major surgery but is in critical condition; she will need to be hospitalized for several months and remain under home care for her first year. Ellie’s father is Jesse Miller, also a District 4/Detroit Lakes engineer. Because Bridget Miller was unable to work throughout most of her pregnancy, she has exhausted all of her leave. She stays at the hospital with Ellie, while Jesse goes to work and cares for Ellie's two older brothers, Kyle and Austin. Carl Miller, a 19-year employee of Mn/DOT, serving in the District 6/Rochester Truck Station. Miller was diagnosed with acute kidney failure in August 2005, and underwent a kidney transplant on March 24, 2006; he expects to be off work at least six to eight weeks as he recovers. Lowell Crowell has worked for Mn/DOT since 1987 at the District 4 headquarters in Detroit Lakes. He was diagnosed with cancer in April 2005 and underwent major surgery, followed by radiation treatments and more surgery. To make a donation to the program, complete a Vacation Donation Program Authorization Form and give it to your payroll representative. You can donate up to 12 hours of accrued vacation hours each fiscal year to one or more recipients. The form is available at http://ihub.bss/documents/vacation_donation_cont_form.doc. For more information about the program, see the Department of Employee Relations Web site, http://www.doer.state.mn.us/deptwide/SEMA4/vacdonpr.htm. Questions about the program should be referred to your payroll representative. Mn/DOT employees who are interested in how other states are approaching a new initiative or issue can use a new federal search engine. A new federal search engine makes it easier to navigate the web of federal, state and local government Web sites by allowing users to search all levels of government with one touch. The service was added to the U.S. government's official Web portal - FirstGov.gov – earlier this year. The search engine may be helpful to Mn/DOT employees who are interested in how other states are approaching a new initiative or issue. For example, a search for documents with “design build” in the title will produce links to information about design-build programs for several states, along with information from the Federal Highway Administration. A search for “50 year interstate” finds Web sites from across the nation commemorating the 50th anniversary of the interstate system and also provides links to the FHWA site. Previously, to find this information you would need to search each state Web site separately, or use a search engine such as Google that would not focus on government sites. Another benefit of the FirstGov.gov search engine is that it provides better service to citizens who do not always know what agency or level of government provides the service they need. By searching for pages with the words “boat registration” anywhere in the page and limiting the search to Minnesota , you are brought to the Department of Natural Resources Web page that provides information about watercraft registration and also to county Web sites that provide the service. The FirstGov search engine allows users to perform either simple searches or advanced searches to look for very specific information. The site also offers search tips and is available in Spanish. A link to the Firstgov search engine is now available from Mn/DOT’s search pages. For more information, see: http://www.firstgov.gov/Federal_Employees/FG_Buzz/Newsletter_0124.html#launch and the Firstgov.gov Web site, www.firstgov.gov. 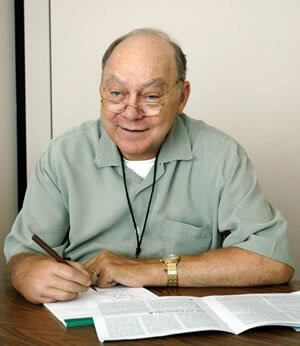 “It ain’t over ‘til it’s over,” Yogi Berra’s famous line, might well describe George Thibault’s philosophy toward work. 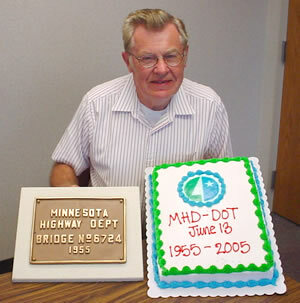 Thibault, who started working at Mn/DOT in June 1952 between his junior and senior years in high school, retired officially in September 1997. Although he was used to people good-naturedly pointing out that they weren’t even born when he started working, it was when one young woman told Thibault that her mom hadn’t even been born yet that he figured maybe it was time to retire. However, four months later, the Office of Transportation, Data and Analysis asked him to come back temporarily to fill in as a supervisor. Every year since then he has returned to the department as a part-time, intermittent employee, thus far serving two stints with the Office of Land Management and another four with the Rail Section of the Office of Freight and Commercial Vehicle Operations. 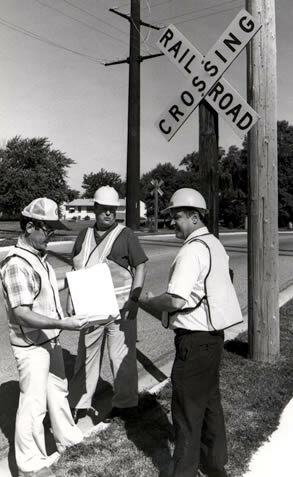 Currently, Thibault is involved with GIS projects for railroad crossing inventory and project management. Back when he was a new kid himself, Thibault earned $1.13 an hour as a laborer in the Detroit Lakes district. Working on Hwy 34 between Dunvilla and Barnesville that first summer, he shook gravel through a sieve to determine if the material was the right gradation for the job. The summer of 1953 found him working on the survey crew on Hwy 75 near Georgetown in the Bemidji district. That fall, he enrolled in the civil engineering program at the University of North Dakota —Grand Forks, but returned each summer to work on Mn/DOT road crews. 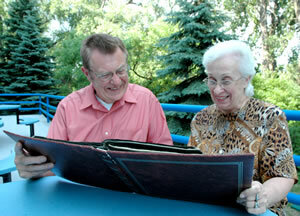 In 1955, he took a four-year military leave from Mn/DOT and joined the U.S. Air Force. While Thibault was in Germany, and later Florida, his co-workers back home were beginning to build the interstate highway system, thanks to legislation that President Eisenhower signed in June 1956. In 1959, near the end of his military service, Thibault wrote to Lee Nelson, then head of Human Resources, who suggested Thibault stop by Central Office when he was home on leave to see about job opportunities. Thibault headed for 1246 University Ave. in St. Paul and found that the Central Office had moved to a new location—the current Transportation Building on the Capitol mall—during his absence. Thibault returned to Mn/DOT that fall to work in the Traffic Engineering unit, drafting freeway signs, and was responsible for the first draft of the traffic engineering manual. From 1960-75, he was involved with the right of way acquisition process for many interstate projects, including the Interstate 94 corridor through Minneapolis and St Paul. “This involved laying out right of way to cover the construction limits of the projects, determining property locations based on abstracts of title, preparing the legal descriptions, measuring and photographing the buildings, and drafting the floor plans of the buildings to be acquired,” Thibault said. This information was included in the property appraisals to determine the state’s offer. Thibault, who has worked under all of the department’s 16 commissioners except the first two, noted that Mn/DOT is a good recruiting ground for student workers—“not only for starting a career, but having a good long career here,” he said. “The advice I would give any current or future employee would be to find out how what you do fits into the overall department picture,” he said. "Stick with a job long enough to learn how to do it well, then move on to some other area and do the same thing." As for when Thibault might “retire” again, he said it may be the day someone tells him that 1952 was before their grandmother was born. Jack Pirkl and Darlene Lazer have both logged 50 years of service with Mn/DOT. They credit some advice they received on their first days on the job for their long, rewarding careers. In 1955, after being dropped off by his father at a resident office in Maplewood, Pirkl asked “office man” Don Roberts what he should do. “Follow Harry,” Roberts told Pirkl as he gestured toward Harry Smith, a veteran bridge inspector. Smith took the 18-year-old Cretin High School graduate in tow. He taught Pirkl the basics of bridge construction and inspection, launching his career with Mn/DOT. Lazer moved to St. Paul in 1956 from Lanesboro just after graduating from high school to seek employment. A few days later, Lazer passed the state’s typing and stenography tests, and was informed there was an immediate vacancy in the license bureau. Impressed with Lazer’s directness, the manager told her there was also an opening with the Department of Highways for a stenographer. She accepted, then walked from the State Office Building to 1246 University Avenue to begin her career with Mn/DOT. Both of their careers advanced quickly from those early days. Pirkl worked on other bridge projects including two on the University of Minnesota’s main campus and the first Wakota Bridge that carried Hwy 100 across the Mississippi River. He also worked on survey crews and projects such as building the “Mother Lake” interchange that joined Hwy 62 and Cedar Avenue in Richfield. 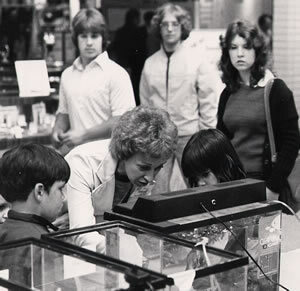 Pirkl’s expertise grew; in 1971 he earned registration as a professional engineer. He worked on the highly controversial Interstate 35E project in St. Paul and led construction of the concrete median barrier that separates traffic on I-94 in Minneapolis and St. Paul. In 1974, Pirkl switched from construction to maintenance operations. “I was happy to use the spec book as a reference and not as a bible,” he said. Lazer progressed through a series of administrative jobs with increasing responsibility. After working at the old headquarters building on University Avenue and in the Central Office, Lazer moved to the then new District 9 offices in Oakdale. She supervised the front desk staff and the file room. Kermit McRae, a former district engineer, chose Lazer as his administrative assistant and expanded her roles and responsibilities. She worked with McRae and 11 other district engineers in the former Oakdale District and the Metro District. While working with Mn/DOT, Lazer also led efforts to achieve recognition for office administrative assistants as professionals and their role in an organization’s success. She earned recognition for herself as well, being cited several times for ability, leadership and focus on customer service. Lazer has served as the top administrative aide with the Metro District since it was established in 1989 and inspired four generations of Mn/DOT employees with her loyalty, competence and outgoing personality. Lazer and Pirkl both embrace change, but they also lament the passing of a time when the rules were looser and the people were closer. Lazer said she once made and wore a bright orange hot pants outfit to persuade Joe Clancy, a much-loved but very shy building maintenance worker, to attend a 1971 retirement party in his honor. “His wife told me that’s what it would take to get him there, so that’s what I did,” she said. During the early parts of his career, Pirkl said decision-making was frequently done in the field, often by intuition, and that staff and contractors often shared a round of beers on Friday afternoons to relax after a hard week’s work. Pirkl also said that field staff occasionally purchased materials or contractors’ work before the funds were officially made available to pay them in order to keep their projects on schedule. “We got caught a few times, but there were a lot fewer auditors back then,” he said. Bruce Lattu, a 21-year state employee, now is the disability programs coordinator in the Office of Affirmative Action. 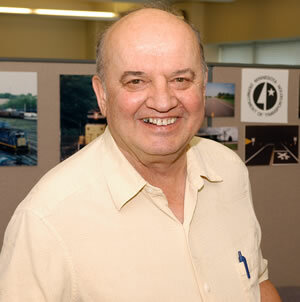 At the time of his illness in 2001, he was an investigator for Mn/DOT’s Labor Relations section. It was five years ago this month that I became a recipient of the state’s vacation donation program (see related article in Business section of today’s Mn/DOT Newsline). Like many people, I never expected that I would need to tap into the program’s funds. After all, I had several weeks’ worth of vacation and sick leave, which I thought would be enough to see me through a kidney transplant and recovery during the spring of 2001. But then I experienced severe complications. The immune-suppressant drugs I was taking to prevent my body from rejecting my new kidney also allowed a dormant staph infection from an earlier, unrelated surgery to spread. Eventually, I had to have my lower right leg amputated to avoid further spreading of this infection that was putting my health and new kidney at risk. My vacation and sick leave ran out in June 2001. Although the state has a generous leave-without-pay program, it still doesn’t pay the bills—especially those costly health insurance premiums. Even with my wife’s income, we were facing a tremendous financial burden as I slowly recovered from the transplant and the amputation and the fitting of a new prosthetic limb. I strongly encourage all Mn/DOT employees who have extra vacation time available or a willingness to help another employee in need to donate what you can. Whether it’s for someone you know or for a complete stranger, your vacation hours will support a worthy program, for a worthy cause, for a worthy person. I feel blessed to have had so many people care enough to help me out, and I know the person (or people) you help will feel that way, too. Thank you. During the last two weeks, we have received many positive comments from employees about the new look and direction of Mn/DOT Newsline, which debuted June 7. You seem to like the new design and expansion of the types of articles Newsline now covers. But the one question asked most often was this: What happened to all the employee information (e.g., promotions, retirements, transfers)? The short answer is that, at least temporarily and in its current format, Employeeline has been put to rest due to limited resources. This change primarily affects staffing news from within the Central Office. Most district newsletters continue to print staffing news for their work areas. The Office of Communications currently is consulting with other offices to see how this type of information can be best collected and communicated to employees. We will keep you posted as we work toward a solution.